Montblanc marks its 110th anniversary this year with a new 4810 Collection, where 4810 refers to the height in meters of the highest mountain in the Alps, the Mont Blanc. Part of the new line is the 4810 ExoTourbillon Slim timepiece, which combines the Maison’s patented ExoTourbillon complication with the addition of a quick stop-second function. 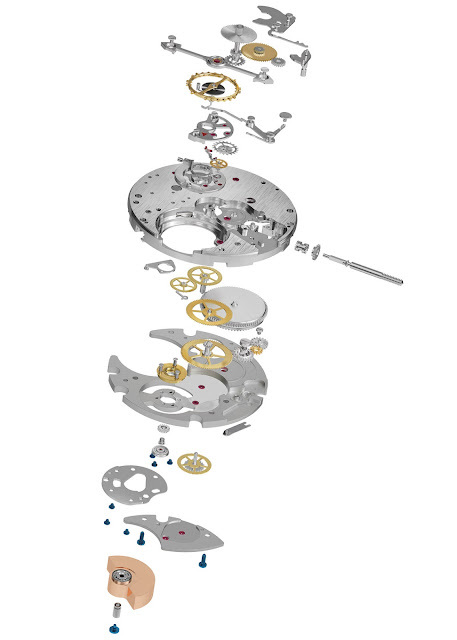 Compared to standard tourbillon constructions where the tourbillon mechanism is enclosed inside a correspondingly large and heavy rotating cage, the ExoTourbillon isolates the screw balance from the rotating cage so the cage is smaller than the balance, which oscillates outside the rotating carriage and on a higher plane. In fact, the Greek prefix “exo” used in ExoTourbillon, means “outside” or “external”. Thanks to this approach, the weight of the cage is minimal, thus resulting in higher precision and improved isochronism. Moreover, a smaller rotating cage has less mass so it needs less energy to support its rotary motion. The ExoTourbillon construction achieves a 30% energy saving compared to a traditional tourbillon architecture. The balance wheel with 9.7 mm in diameter also plays an important part in the performance of the timepiece thanks to its 18 screws with four gold screws that can be adjusted and 14 screws that are fixed - further improving precision and traditional watchmaking aspect. 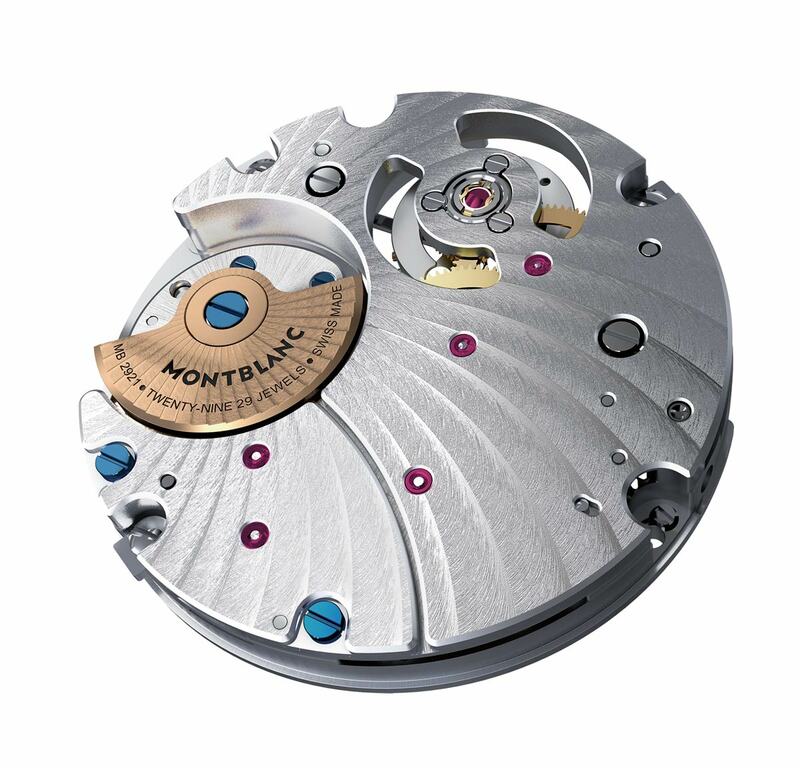 Beating at 21,600 vibrations per hour, the Calibre MB 29.21 ExoTourbillon automatic movement incorporates a new, super-fast micro-rotor decorated with a Côtes de Genève motif and allows an uninterrupted view on the movement through a sapphire crystal case back, in comparison to a standard rotor that always hides half of the movement. 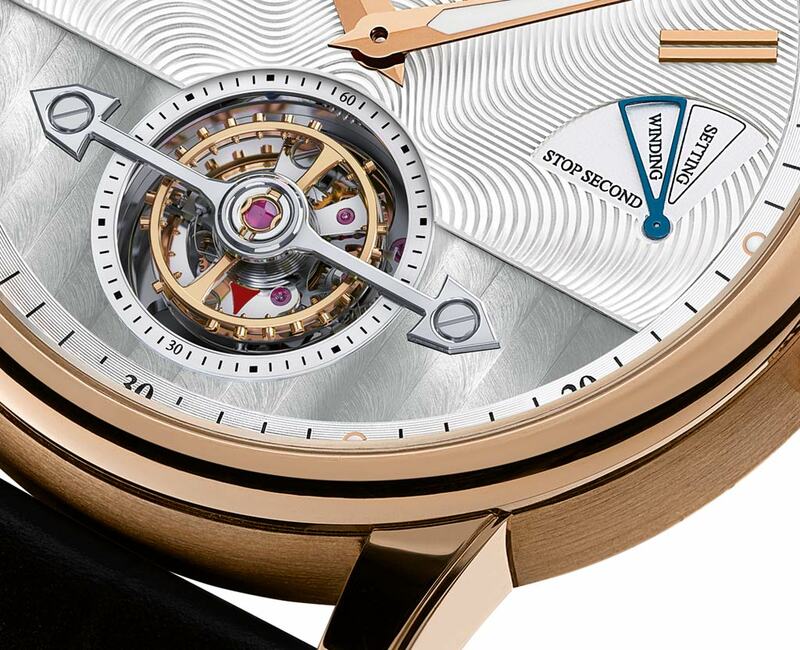 Embedded under the main plate, the barrel guarantees a 50-hour power reserve. The silvery-white dial is decorated with the signature Montblanc Star guilloché design on the upper section, while the bottom half of the dial has been adorned with the Côtes de Genève motif to highlight the ExoTourbillon construction at 6 o’clock. 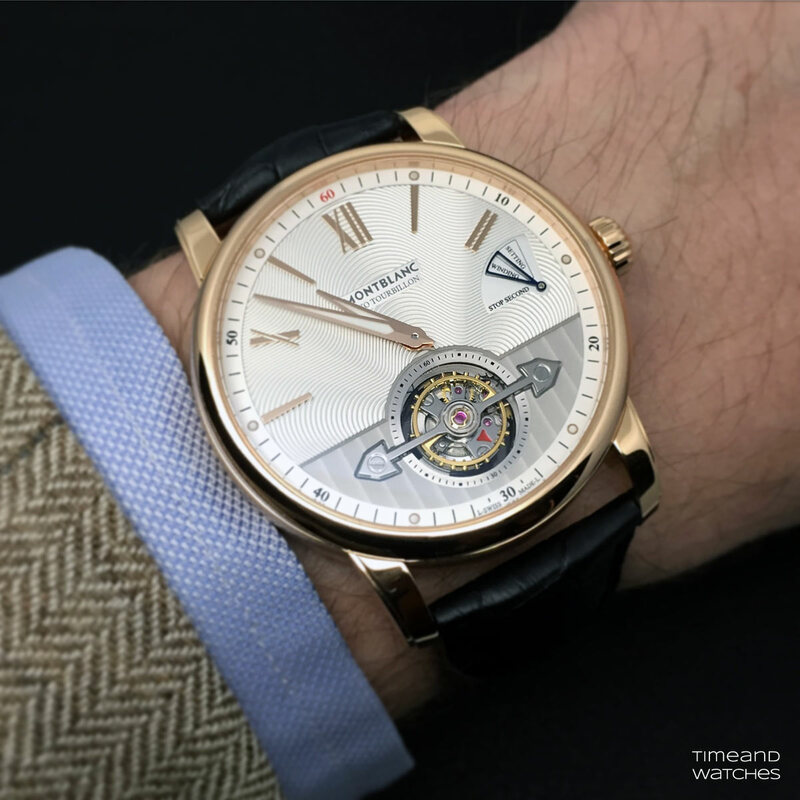 Red gold-plated Roman numerals and red gold-plated hands filled with white SuperLumiNova enrich the dial. Around the outside of the dial, a discreet minute track has been added with a red "60" at 12 o’clock adding a touch of colour and enhancing legibility. A red arrow on the tourbillon cage indicates the seconds and features a practical quick stop-second mechanism. This quick stop-second function is made possible thanks to the construction of a whip, which halts the large screw balance with its 18 screws and restarts it on demand. 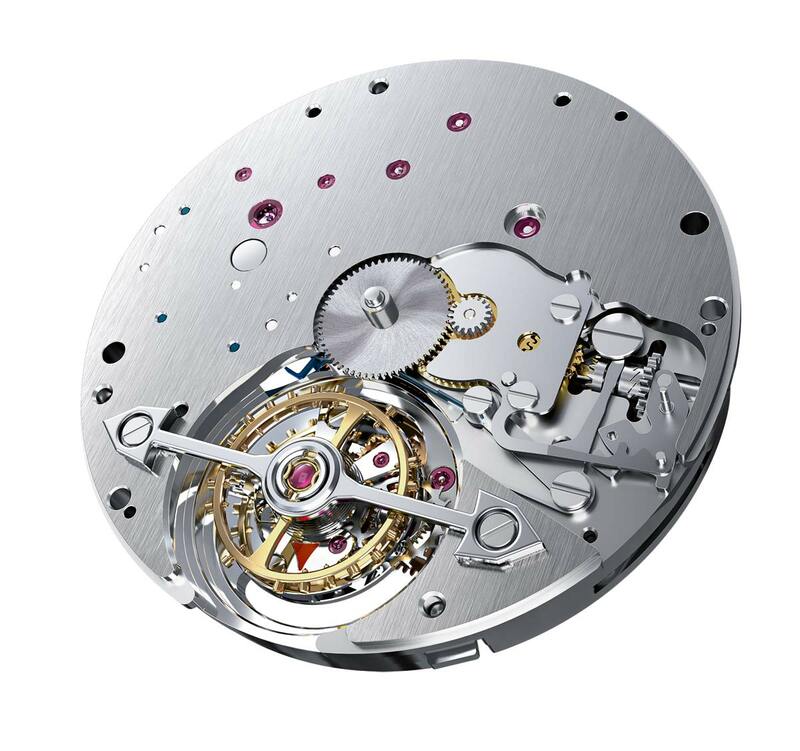 All the functions and operation are set via the crown at 3 o’clock, thanks to a gauge on the dial that informs the wearer which setting the crown is in: Position 1 for winding the movement, Position 2 for setting the time and for the quick stop-seconds mechanism. 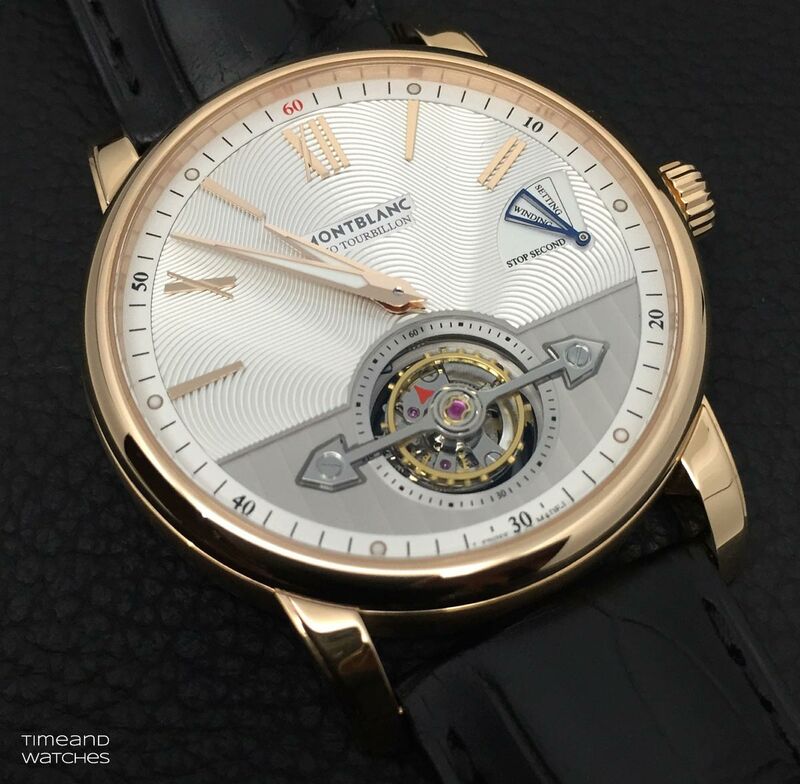 Crafted in red gold, the case is satin-brushed in its middle part and has a diameter of 42 mm, with a total height of 10.14 mm. It offers water resistance to 5 bar (50 metres / 165 feet). 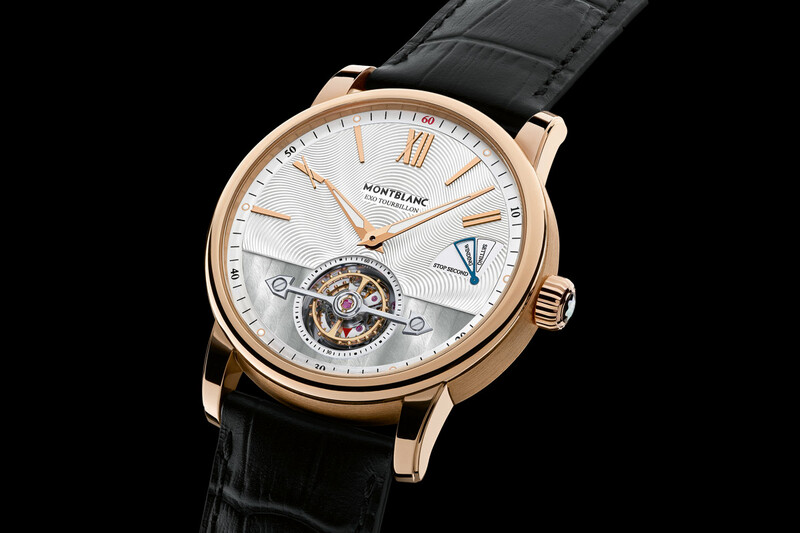 The Montblanc 4810 ExoTourbillon Slim (ref. 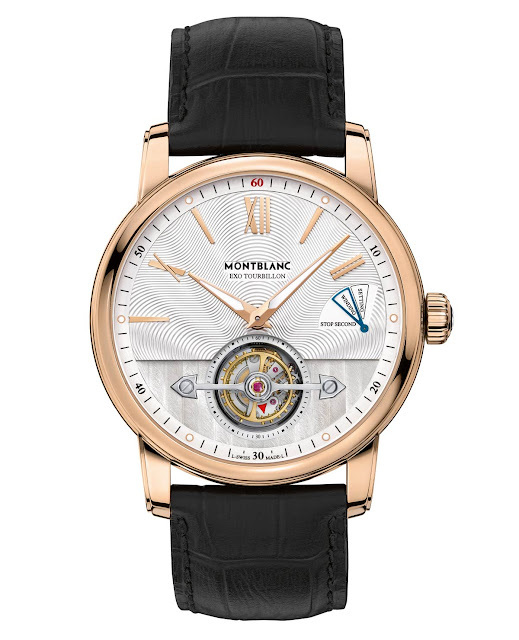 114864) is fitted with a black alligator strap and, like all the references of the new 4810 collection, has been tested by the Montblanc Laboratory Test 500, simulating real-life wear for over 500 hours. The retail price is Euro 34.500. 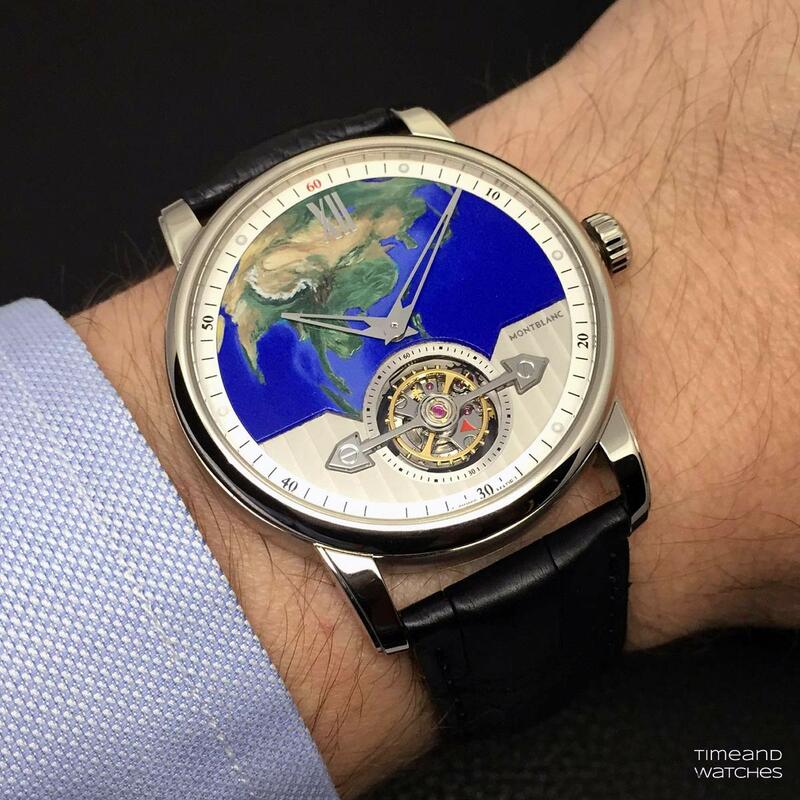 Montblanc also presented the 4810 ExoTourbillon Slim 110 Years Editions, three timepieces with the same features of the standard edition but characterised by hand painting of a map of the North American (36 pieces), European (36 pieces) and Asian (38 pieces) continent on the dial. 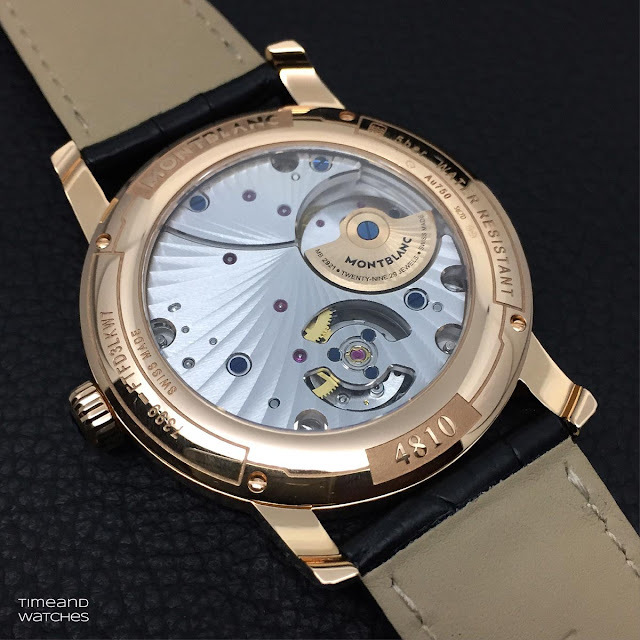 SIHH 2016: Montblanc 4810 ExoTourbillon Slim. Montblanc marks its 110th anniversary this year with a new 4810 Collection, where 4810 is the height in meters of the highest mountain in the Alps, the Mont Blanc. Part of the new line is the 4810 ExoTourbillon Slim timepiece, which combines the Maison’s patented ExoTourbillon complication with the addition of a quick stop-second function. The Montblanc 4810 ExoTourbillon Slim (ref. 114864) has a retail price of Euro 34.500. 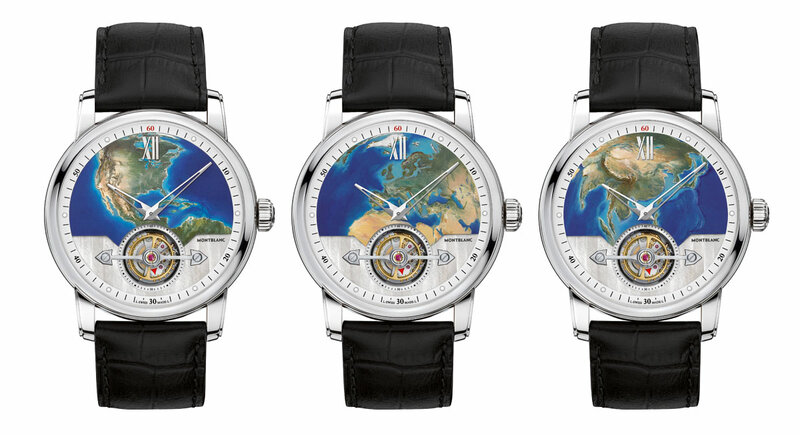 Montblanc also presented the 4810 ExoTourbillon Slim 110 Years Editions with a retail price of Euro 42,500.